The Faculty of Law, Canon Law and Administration maintains two libraries: the Library of the Institute of Law and the Institute of Canon Law on the premises of John Paul II College (Collegium Ioannis Pauli II) and the Library of the Institute of Administration and the Institute of European Studies on the premises of the Collegium Iuridicum. The book collections are available in the first place to researchers and students of the faculty. However, the libraries also admit persons from outside the faculty. The book collection comprises ample law and canon law literature. The most valuable titles are old prints (131 volumes) of canon law, Roman law, church history and universal history. The oldest works date back to the early sixteenth century. Currently, due to the requirement of proper storage, they are deposited with the University Main Library. The library reading room can seat 38 students and offers computer terminals equipped with the legal information system (LEX). The collection is catalogued in a traditional way (card catalogue) and has been undergoing a gradual digitalization since 2000. The library is overseen by Ms. Jadwiga Surdacka. The library opened in the academic year 2009/2010 in the building of Collegium Iuridicum. It has a reading room with twenty computer terminals connected to the Internet and the legal information system (LEX). The catalogue is fully digitalized. The library manager is Ms. Iwona Uliasz. 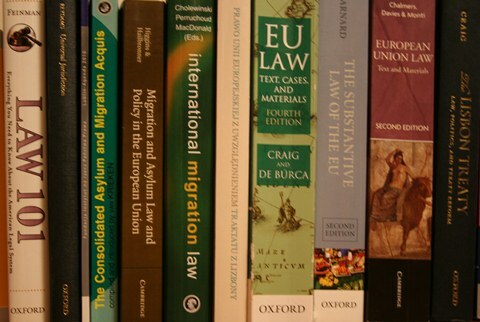 The Institute of European Studies has purchased new 20 books for student's use. Attached is a list of them.